Home Who’s Brewing in Ottawa 2013 July 04 FEATURE: Capital Mashup – Shane Clark, Beyond the Pale Brewing Co. FEATURE: Capital Mashup – Shane Clark, Beyond the Pale Brewing Co.
Jeff Broeders, brewer at Indie Ale House and Shane Clark, brewer at Beyond the Pale. preview of what's going down July 7 in Parkdale Park. Our third interview is with Shane Clark of Beyond the Pale Brewing Co. For the Capital Mashup he was teamed with Jeff Broeders from Indie Ale House in Toronto. Beyond the Pale opened in December of 2012 with four flavour packed brews and are already going through an expansion (which included borrowing some fermenting tanks from Beau's) to keep up with demand. Ottawa Beer Events: Can you tell us about the collaboration beer? Shane Clark: Belgian Golden Ale. 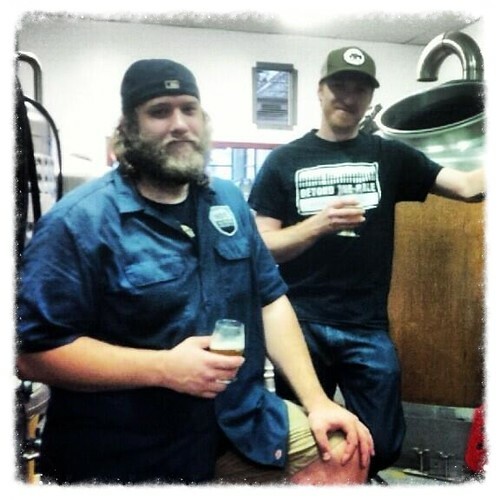 How do brewers collaborate on beers? Can you explain the process (if there is one)? decisions were made on the day of. How did you like brewing in their facility? to see how other people go through a typical brew day. Were there any challenges? Did anything throw you for a loop? Not really. Pretty smooth brew day. What other beers will you have available at the Capital Mashup? rain or shine – prepare yourself for the Ottawa weather.